Sharp corner in a pipe or conduit, as opposed to a bend, which has a larger radius of curvature. The arm joint formed at the junction of the humerus, radius, and ulna. A fitting that connects two pipes at an angle, often of 90°. A sharp corner in a pipe. In a waveguide, a bend of comparatively short radius, normally 90°, and sometimes for acute angles down to 15°. A sharp change in direction of a coast line, channel, bank, or so on. 1. 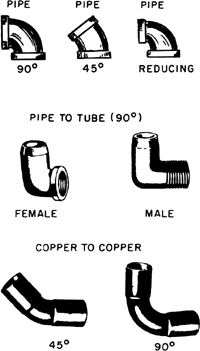 A pipe, sheet metal, or conduit fitting having a bend, usually 90°; a 90° elbow is also called an ell.